I've started watering it again, and everything is moving along just fine. The carrots are growing, the lettuce is still alive, herbs are all doing well, and the tomatoes are flourishing everywhere I planted them, and a few places I didn't. Okay, everything isn't exactly fine. 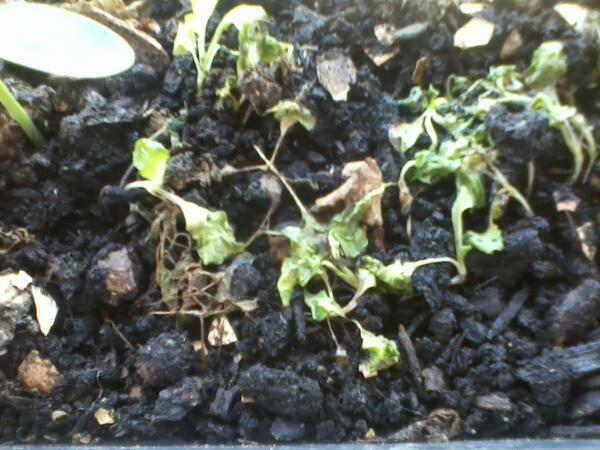 I've pinched them off in pots where other things are growing and left them alone in pots where I only discovered them after they'd choked out the previous tenants. So if these things all produce tomatoes, I see a lot of salsa in my future. If not-- well, I guess I'll feel pretty dumb. Do you garden? How is it going? Do you need some tomatoes? This would normally be a Sunday post, but since tomorrow is Mother's Day and apart from phoning my Mummy and both my Grannies, I'll be hiding in my apartment from all the happy mums with their happy children (mostly I'm okay with the infertility thing, no really, I am, but there have been more than the usual number of twists of the knife on the interwebs lately and so I'm feeling a bit bitter about Mother's Day this year), and not blogging about anything. Is a bit dramatic, even for me, but it's pretty much how I'm feeling this weekend. Anyway, I did have something to say today, believe it or not! I ran across this quote on Twitter a few days ago: "[When] people say, 'I'm to busy to commit to ministry,' they're actually saying, 'I won't give up what it takes to commit to ministry.'" For the record, I know this statement was not directed at me personally. But it comes right after Chad & I chose to once again pass up the chance to get involved in the children's ministry at church. And the only reason we passed on this is because I'm struggling-- a lot-- to keep up with grad school and still do my job. And while I readily admit this is my own problem, adding on another responsibility that I would take very seriously and which would add at least another 5 hours of work to my week (that's a bare minimum-- most of the time, I spend more like 10 hours per week children's ministry prep) is a terrible idea. So, yes, person on Twitter: What I'm saying is, "I won't give up grad school to commit to ministry right now." But see, there's the kicker. 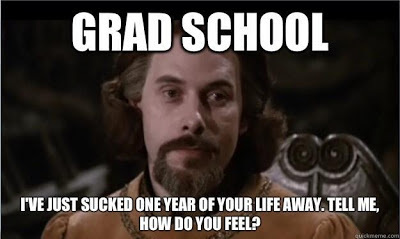 Grad school will only last for a season, and it has come more or less on the heels of a season of being involved in children's ministry for 10 years at two different churches. And statements like that do nothing for getting me-- and a lot of others, I should imagine-- excited about jumping right back into a ministry once my seasons change. I miss children's ministry. I loved it enough to keep at it for 10 years despite hearing at least once a month from some misguided idiot, "Why are you doing this? You don't even have kids!" I loved it enough to stay up late and wake up early to make sure I was prepared for class. I loved it enough to call my co-teachers on Sunday nights and say, "I don't think x is working for this class. Can we meet and talk about it?" I loved it enough to host all-night slumber parties for giggling girls who were in my class. When I gave it up, I didn't do so lightly. I've always believed that if I'm going to do this, I'm going to do it well. The fact that I don't have children of my own makes me even more determined not to just phone it in, because 1) These parents have entrusted their children to me, even if only for a short time, and 2) If parents can put in the effort involved to get kids up and scrubbed and dressed and in a reasonably good mood on a Sunday morning, I owe them at least that much effort in return. Someday, this season of struggling to figure out how to be good at grad school and at life at the same time will pass. Someday, I'll be ready to jump into a ministry again. But until then? People using Twitter to guilt the universe into doing something is really not going to work, except make me reluctant to rejoin the work I once loved.